The Manchester Sky Blues controlled 66 percent of the possession, as they normally do against over-matched sides, and they poured in 24 shots to boot. Fulham’s midfield was nonexistent, and considering City have the most midfield talent of any club in the world, it’s not surprising that they would have such dominance in the middle of the pitch. But Fulham didn’t have it to make it so easy for them; David Silva, Ilkay Gündoğan, and Kevin De Bruyne looked like they were having a kick-around in the park, rather than playing in the supposed best league in the world. You can’t blame City for this. They’re in a dogfight with Liverpool for the title, and they will face Tottenham Hotspur in the Champions League quarterfinals next month. Whenever a top team gets a chance to take their foot off the throttle and coast to an easy three points, they take it. Unfortunately for Fulham, they’ve been an easy three points for the majority of this season. It wasn’t supposed to be this way. Fulham were promoted to the Premier League after winning the promotion playoffs last season, and they spent accordingly in the transfer window. Nice’s Jean Michaël Seri (once a Barcelona target! ), Marseille’s André Zambo Anguissa, Swansea’s Alfie Mawson, and Newcastle’s Aleksandar Mitrovic (the only signing to somewhat live up to his fee, leading Fulham with 10 Premier League goals this season) were brought in for a total of $104.7 million in the summer. There was a general excitement that this retooled side could not just survive the Premier League grinder, but actually thrive and finish in the lower ends of the mid-table. Sure, most of the promotion hype was directed at last year’s Championship title winners, Wolverhampton Wanderers, who have fulfilled that promise, currently sitting in seventh place in the English top flight. But Fulham...Fulham were supposed to be better than this. After Saturday’s loss, Fulham have scored just 29 goals in 32 games, while conceding a division-high 72; it’s not even close when it comes to that unwanted title, as Burnley has conceded the second-most goals with 59. They are one of the weakest teams at defending from the wings, as City proved on Saturday; both goals came from the right side of the pitch, as Bernardo Silva carved them up like his name was Lionel and he was Argentine. 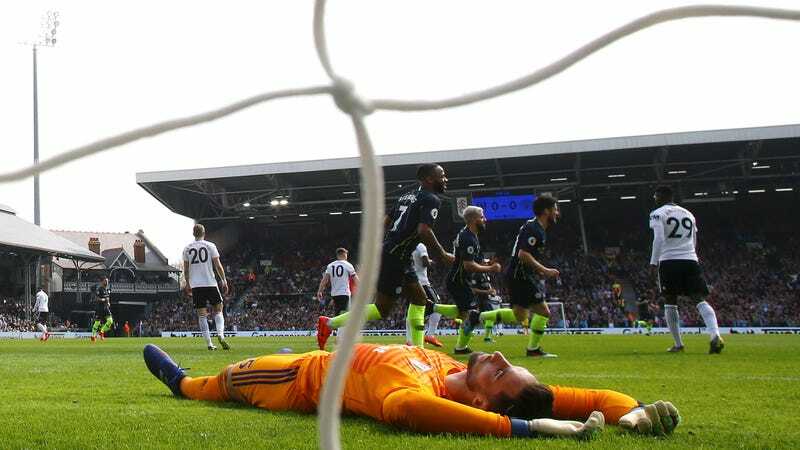 And, as if the on-the-field misery weren’t enough, Fulham were also part of the dumbest “scandal” of the Premier League season, all over a missed penalty and some training ground fighting. While Fulham is saved the indignity of being in last place in the Premier League—Huddersfield Town has been even more futile, sitting three points behind the London side, but at least there were no delusions of grandeur there—there is no longer any doubt that there will be Championship soccer again at Craven Cottage next season. For all the money that Fulham spent, and even for the mid-season hiring of former Leicester City miracle worker Claudio Ranieri (who was summarily fired after 17 games, only three of them wins), the Ham Boys are caught up in the English soccer yo-yo nonetheless. Manchester City brought their C+ game on Saturday, and Fulham could only respond with what they have known all season long: a big, fat F.